Premium Special Application Grease for Couplings. Product name: Lubrigrease CEP 1 is a high tech product suitable for lubrication of flexible couplings working at speeds that can cause conventional greases to separate. The lubricating grease retains its structure under high centripetal acceleration and prevents leakage. Lubrigrease CEP1 is a polyethylene thickened grease based on mineral oil. The grease contains antioxidants, corrosion inhibitors, EP/AW additives and a small amount of lithium complex soap. The special thickener has the same density as the oil which prevents the grease from separating in applications with high centripetal forces. The lubricating grease offers good load carrying capacity and corrosion protection. Flexible couplings are relatively small in comparison to the equipment they tie together. However, they play a large role in equipment reliability. A coupling failure could cause significant downtime and maintenance costs. Couplings are mechanical connectors that transmit torque while accommodating shaft misalignment. Couplings prevent inevitable shaft misalignment from causing stresses that could shorten the life of power-train components and cause downtime. deflection, component wear, thermal expansion, and externally induced stresses. Misalignment can be angular, when the axes of theshafts intersect but are not parallel, offset, when the axes of the shafts are parallel but do not intersect or a combination of both. 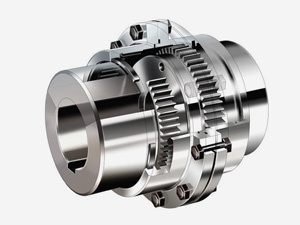 Gear couplings operate by transmitting torque by the engagement of external teeth on the toothed hub. 1. with the internal teeth in the sleeve. 2. The teeth mesh at the outer circumference of the coupling inner cavity. Small clearances between the internal and external teeth allow the teeth to slide and pivot in relation to one another while transmitting torque smoothly. Grid and chain couplings operate on the same principle, but the internal teeth on the sleeve are replaced by a spring steel grid or chain, respectively. Gear-, grid-, and chain-type exible couplings with metallic surfaces that slide and pivot against each other require lubrication to prevent wear. The lubricant must be very viscous to withstand high loads induced over small contact areas. Grease is usually the lubricant of choice due to the ease of application and the ability to keep it in the assembly. It is the centrifugal action of the rotating coupling that forces the grease to the outer circumference of the inner cavity where it can be re-engaged between the teeth to form an oil fi lm and prevent wear. If the coupling is turning too slowly and not subjecting the grease to suffi cient forces to keep it in the outer circumference of the inner cavity, the teeth will not have a suffi cient supply of lubrication. The result is high coupling wear and failure. This condition can be remedied by using a more fl uid grease or high-viscosity gear oil. A more fl uid lubricant will enable it to move into the load zone between the sliding and pivoting gear teeth without the aid of centrifugal forces. But the centrifugal gravitational forces that enable the grease to remain effective can also prove counterproductive. First, grease is a suspension of a thickener in a lubricating oil. And it is the oil that provides the lubrication. But most general-purpose greases contain thickeners with a higher mass density than the oil, and if subjected to the centrifugal forces in a rotating coupling, the thickener will separate from the oil and accumulate in the tooth mesh area. The lubricating oil accumulates in the center of the coupling where it serves no useful purpose. This condition will cause high coupling wear and failure; therefore, a coupling grease must be built to resist this centrifugal force destruction. Flexible couplings that employ metallic surfaces that slide and pivot will have a short life and contribute to unexpected downtime if not properly maintained. Proper coupling maintenance includes selecting the proper coupling for the application; installing it with minimum misalignment; having frequent external inspections for leaks, missing or loose bolts, and vibration; and periodic realignment, relubrication, and internal inspections. Proper relubrication includes both checking that the coupling maintains a proper level of lubricant throughout the specifi ed relubrication period and that upon relubrication, the coupling is taken apart, thoroughly cleaned, hand-packed with new grease, and seals replaced before reassembly. Relubrication without the practice of disassembly will contribute to premature coupling wear. Disassembly allows contaminants and spent lubricants to be removed. The coupling should be filled approximately 75 percent full.